A few nights ago, as I was drifting off to sleep and in that place where consciousness has relaxed and sleep is taking over, I saw the title of this post “highly sensitive = strength” in my mind. This doesn’t often happen for me, though I do have vivid dreams. I knew immediately that this phrase was meant to go on my newly designed web site’s home page. Beyond that I began thinking, “how does highly sensitive equal strength?” Yes, I have written a good deal about resilience and the highly sensitive person and believed personally that HSPs are some of the strongest individuals I know. What I didn’t know, or perhaps appreciate well enough, is being highly sensitive, can and should be distilled down to this phrase because for too many HSPs being highly sensitive is seen and felt as a weakness or challenge more than a strength. What am I implying by the word strength? What does it mean when we say “strong?” Usually we’re implying concepts like unyielding, impassive, unmovable, or forceful. I think there’s more to it than those simplistic ideals. Strength can be thought of in many ways: emotional, social, intellectual, even passion, but my instinct tells me that the compact phrase that appeared in my dream suggested more. Yes, it was inclusive of the above, but it was also pure spiritually and full of humility and altruism. It is for all of us, highly sensitive or not, because HSPs do not exist in a vacuum. We are an integral part of the human species who happen to have a marginally rare personality trait evolved to enable the survival and flourishing of the species. Our strength lies in knowing how others are feeling at any moment, being willing and able to heal our tribe/community/family as individuals react to the stresses of the world. Our strength lies in embodying what it means to be deep-thinking and deep-feeling individuals who have a gift for envisioning connections between concepts, plans, and ideas and in making new plans that take into account long-range considerations and opportunities. Our strength lies in imagination and creativity, expressing the beauty of life and the darkness. We are the heart on the sleeve for everyone too timid or lost to express it themselves. We are also the passionate ones who fight with heart and conviction when wrongs are being draped over us by evil people who have lost their way and who seem to have forgotten that humanity, and all of life, is interconnected, interrelated, and interdependent. We are the voice for the voiceless. Our strength lies in embodying what it means to be fully human, fully alive, and fully awake. Highly sensitive = strength is now emblazoned in my mind as a rallying call to know ourselves, to adapt our lives in ways that facilitate wholeness and balance, while enabling us to turn our focus onto the world in a thousand ways that heal, inform, educate, and promote enlightenment of the human spirit in a time when it seems to be flickering and doubting itself as to its worth. You may have noticed I have been absent from creating new blog posts for a few weeks. That time has allowed me to put the finishing touches on my long-awaited book addressing HSPs and careers. The book is titled Thrive: The Highly Sensitive Person and Career and is based on the work of Dr. Elaine Aron while extending her research into the imminently practical arena of career. So many of us HSPs have a difficult time finding just the right working situation, myself among them, and that experience led me to base my PhD dissertation on the subject and, now, to carefully craft a well-researched new book geared directly toward the HSPs who wish to know themselves better, better understand how the 21st Century offers us opportunities that did not previously exist, and connect us with impassioned narratives from our fellow HSPs. I’ve pulled out all the stops on this book and held nothing back. In Thrive you will find results of two studies that revealed the way we HSPs experience career, plus hard numbers that back up my findings. You will also find much more from me in the way of analysis and advice that is more practical in addressing the real-world circumstances we all find ourselves in. I give you less romance and more practicality in plotting your way forward. While I fully support HSPs finding their true calling I realize and appreciate the depth to which we struggle with empathy, overstimulation, and stresses. However, I do not dwell on the challenges, rather the strengths we all embody (and there are many). 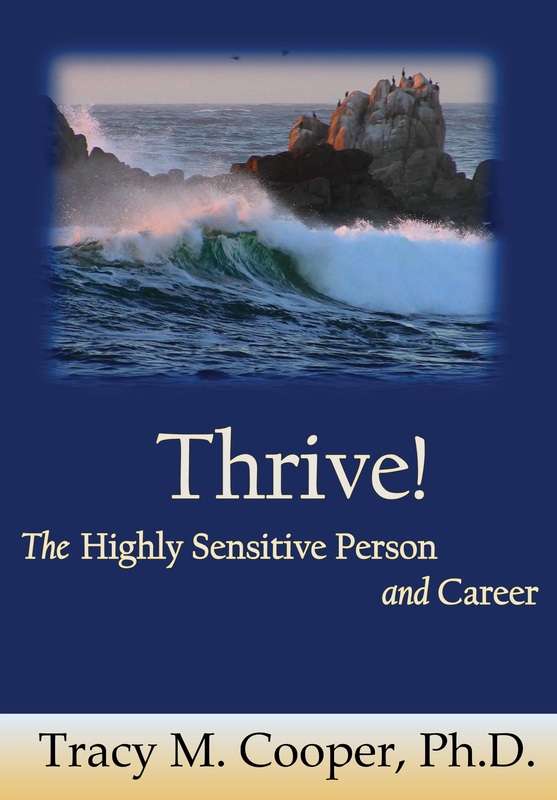 Thrive: The Highly Sensitive Person and Career is written to educate and inform the newly aware HSP in finding themselves, as well as helping those who have been around for awhile and may have read HSP books, but need something more concise. Thrive is an educational journey in and of itself as you explore areas of life like self-care that are often neglected in the hectic day to day rush. Additionally, I explore the high sensation seeking highly sensitive person in this book and provide insight and advice for the 30% of us who are, both, highly sensitive and sensation seekers. Every HSP should have this book in their library. Preorder your copy at drtracycooper.com! Release date is anticipated to be Aug. 1st!